Heritage Makers Heritage Makers began with a simple concept and a simple story. It all started with a daughter, Candace May, who wanted to commemorate the life of her grandfather. She wanted to preserve and pass on his stories, his values, his experiences and his love of family. So Candace got to work. She gathered photos. She collected stories. And she put it all into a handmade book. Candaceâ&#x20AC;&#x2122;s book became the very first Heritage Makers storybook, and the cornerstone of the company visionâ&#x20AC;&#x201D; to help people everywhere tell their stories and preserve their photos. Cards & Invitations Because you really care! Cards and invitations mean so much more when they are custom-made by you! Personalize one of our fabulous templates or make one entirely from scratch. We have lots of sizes, styles and finishing options—so your cards will be as special as the people you give them to! Digital Scrapbooking Capture the moments that matter—big and small! With over 90,000 pieces of digital art, Heritage Makers is a digital scrapbooker’s dream! Get as creative as you wish personalizing our templates or designing pages and albums from scratch. Home Décor There’s no place like a Heritage Makers home! From family portraits printed on elegant canvases to vacation photos featured on lustrous metal prints—your home can be a gallery of treasured moments. With so many home décor products and templates to personalize, you can fill your home with priceless keepsakes! Home Office Promote your business like nobody’s business! Promote your business, your photos, your event and just about anything you want with our premium home and office products! From brochures to business cards—you’ll find there are dozens of creative and useful ways to use these products! Photo Gifts This time it’s personal! Treat friends, family and yourself to one-of-a-kind photo gifts and keepsakes! We have something for everyone, including phone cases, mugs, ornaments, handbags and more. And best of all, you can completely customize each and every product! Storybooks A picture may be worth a thousand words, but it still doesn’t tell the whole story! Celebrate your favorite photos, stories and memories with one of our signature storybooks. Choose from a variety of sizes, cover options, and pre-designed templates (or make yours completely from scratch). Whatever your story— we’ve got you covered! Custom Holiday Projects Using Heritage Makers Studio You can create custom cards for birthdays, thank you notes, get well messages, and more using Studio! Use any of the templates in our Template Gallery to create your personalized design. Here are two examples to get you started. Notebook Birthday 5x7 Greeting Card – Template 132123 1. Search the Template Gallery for “birthday” to display birthday-themed projects. 2. Click on the project you want to edit (in this case, Notebook Birthday). 3. Click on Personalize. 4. Click on Open Project to launch Studio. 5. Read through the tips placed around the image. Be aware of boundaries, like bleed and crop areas. If you want to remove these, click View and Show Design Guides. This is a toggle, so to turn them back on, repeat the steps. 6. To change the text, double-click the sentiment box. This takes you to the text editor. Type your message and click outside box. 7. To change the text, double-click the sentiment box. This takes you to the text editor. Type your message and click outside of the box. 8. Click on the font to use (in this case Typewriter). Click Save. Save after each change you make. 9. To change the size, click the up arrow next to the size or use the sliding bar until your text fills your box. 10. C hange the signature name to your name. 11. R epeat the font and size changes for the other text on the project. 12. O nce all changes are made, you are ready to publish. Click on Ready to Publish. Review the prompt and click Yes if you are ready to publish. 13. C lick the checkbox confirming you have reviewed your entire project and are ready to publish. 14. C lick Add to Cart and continue through the checkout process. Birthday Balloons Thanks 4x6 Invitation – Template 123745 1. Search the Template Gallery for “birthday thank” to display birthday thank you projects. Then click on the arrow beside Greeting Cards and Invitations and click on 4x6 Invitation (second on the list) to narrow the options. 2. Click on the project you want to edit (in this case, “Birthday Balloons Thanks”). 3. Click on Personalize. 4. Click on Open Project to launch Studio. 5. Turn off Design Tips, if you desire. 6. Select the back of the invitation by clicking on the image with the letter “B” below it (you’ll see it in the upper right corner below Design Guide). The invitation’s back is now displayed. 7. Now, upload your photo. Click on My Photos along the bottom edge. 8. Click on the arrow beside My Albums and click on an album. If you do not have an album, click the New Album button and type a name for the album. 9. Select an album and click Add Photos. Use the file structure to move to the folder with your photo. Click on the photo and click Open. The photo is uploaded to the album. 10. Now click on the photo in the card so that a red box appears around the photo. 11. Click and drag your photo from your album up over the card’s image until your mouse pointer is over the “drop photo here to swap” text. Then release mouse. Your photo replaces the original photo. 12. Click the Save button. Repeat this each time you make a change. 13. For this invitation, the text is on the front. Click on the image with the letter “F” under it on the right side. The invitation’s front is now displayed. 14. Double-click the number 5 in the balloons text to enter text edit mode. Type the age of the child and click outside the card to exit text mode. 15. Once all changes are made, you are ready to publish. Click on Ready to Publish. Review the prompt and click Yes if you are ready to publish. 16. Click the checkbox confirming you have reviewed your entire project and are ready to publish. 17. Click Add to Cart and continue through the checkout process. Our Memories for Life Hello. My name is Rhonda Anderson and I proudly represent Our Memories for Life, a quality scrapbooking line of albums, designer collections, and tools. Since 1987, when I co-founded Creative Memories, I have had a passionate commitment to offer photo safe, long lasting, archival photo albums and memory keeping products to the world. I am honored to bring that same commitment to Our Memories for Life. Everyone has photos, memories, and a story to tell. Even with limited time, our beautiful designer cardstocks, with their exclusive designs by Katie Pertiet, will make you feel like an accomplished album maker! And if you love to be creative, we offer Designer Collections and unique tools to make one-of-a-kind masterpieces with products custom designed to mix and match. Please know I stand behind the quality of our products. Our updated book cloth coversets, and all of our designer papers are proudly made in the U.S.A and have been independently tested to be archival and photo-safe. We are committed to be industry leaders and proudly offer new patent pending "disappearing re-enforced edge" refill pages and improved technology in our coversets. Our Memories for Life is the heart and tradition of memory keeping and it would be my honor to serve your scrapbooking needs. Basic Supplies Stock up on supplies that you use for every project! Album Coversets Give your scrapbook pages a permanent, photo-safe home in a stunning 12x12 P strap-hinge coverset album. Covers come in Aqua (USOM400280 ), Sky Blue (USOM400303 ), Hickory Brown (USOM400401 ), Dove Grey (USOM400451 ), Fern Green (USOM400251 ), Blue Canvas (USOM400301 ), Red (USOM400100 ), Black (USOM400050 ), Coral (USOM400136 ), Palm Green (USOM400252 ), Grape (USOM400601 ), Raspberry (USOM400135 ), and Petal Pink (USOM400131 ). Pocket Pages USOM100010 Quickly create a layout using these pockets to slide in photos, journal cards, and border strips. Each page contains two horizontal and two 4x6 pockets, one 6x3.7 Journal Card pocket, and one 1.25x12 Border Strip pocket. Set of 15. Designer Refill Pages Start your layout with a beautiful and strong base using a refill page. Choose from a variety of colors and designs. Patent pending “disappearing reinforced edge” adds strength to your page. Refill pages are available for Black Noir (USOM560050 ), Blue Skies (USOM560303 ), Clean Slate Blue (USOM560302 ), Crème de la Crème (USOM560500 ), Cloud White (USOM560070 ), Crème Linen (USOM560075 ), Solid Black (USOM550050 ), and Solid White (USOM550070 ). 18 ct.
Adhere photos, journal cards, border strips, and more with this double-sided adhesive tape runner. Refill cartridges available separately. Super high-tack, permanent double-sided tape. Works on any kind of paper, canvas, ribbon, wood, photos, etc. Works with heavy embellishments and difficult surfaces. Precision Point 2 Way Glue Pen USOM290123 A dual action glue pen ideal for adhering small items to layouts. Use as a permanent adhesive while glue is blue color and as a semi-permanent adhesive when glue changes from blue to clear and is slightly tacky. Create decorative borders in a snap with design cartridges that punch a continuous 12-inch border. Includes the Butterfly Lace cartridge. Store your Border Maker System and design cartridges in style! Measures 16.5x9.5x4.6. This set of 13x13 organizers has multiple pockets sized for border strips, journal cards, and cardstock. Use it to store your products at home or to organize your photos and products for on-the-go scrapbooking. Set of 5. This generously sized tote (14.75x15x10.5) holds Multipocket Organizer Folders, coversets, tools and more. Use it to store, organize, or transport supplies. Border Maker Cartridges Each cartridge makes a unique decorative border. Designs available are Heart Scallop (USOM250014 ), Butterfly Lace (USOM250019 ), Japanese Fan (USOM250012 ), Scallop Shell (USOM250018 ), Antique Floral (USOM250011 ), Baby Charms (USOM250015 ), Bling Bling (USOM250013 ), Star Party (USOM250028 ), Flower Power (USOM250020 ), Classy Ivy (USOM250021 ), Holly Berries (USOM250022 ), Eyelet Lace (USOM250023 ), Starry Night (USOM250024 ), Balloon Bouquet (USOM250025 ), Heart Paws (USOM250026 ), Zig Zag (USOM250027 ), Greener Grass (USOM250035 ), Cross (USOM250030 ), Musical Notes (USOM250029 ), Sports Balls (USOM250033 ), Pretty Presents (USOM250031 ), Pumpkin Vines (USOM250035 ), Pine Tree (USOM250016 ). Trim cardstock and other media in one of three styles (straight, wavy, or perforated) without switching blades! Replacement blades and cutting mats available separately. Punch shapes from cardstock and other media to create journaling blocks and accents for your scrapbook pages. Designs available are The Real Seal (USOM260003 ), Wild Flower (USOM260004 ), Monarch Butterfly (USOM260005 ), and Snowflake Kiss (USOM260006 ). 7-inch Personal Trimmer USOM200007 Precisely cut photographs and paper up to 7 inches with this trimmer. Store small supplies in the removable drawer. Anthology DIY by Lisa Bearnson Welcome to the Anthology DIY collection by Lisa Bearnson. I’m thrilled to be sharing this creative, new approach to start-to-finish DIY projects. Home décor, paper crafting, card making and scrapbooking have never been easier! Anthology DIY products are designed to make you feel wildly creative in a short amount of time. Card and layout kits contain “recipe cards” showing you exactly how to put each project together. If you have extra time, we provide techniques for making your projects even more creative. All the components in the kits are pre-cut, pre-scored, pre-punched, and all the matching cardstock and patterned paper have been chosen for you. You simply add photos and journaling. Anthology DIY by Lisa Bearnson products are the highest quality, photo and archival safe, and you’ll love the unique, fresh packaging that looks amazing on your shelf. No more wasting time trying to find components that coordinate. Everything you need is already organized and right at your fingertips. 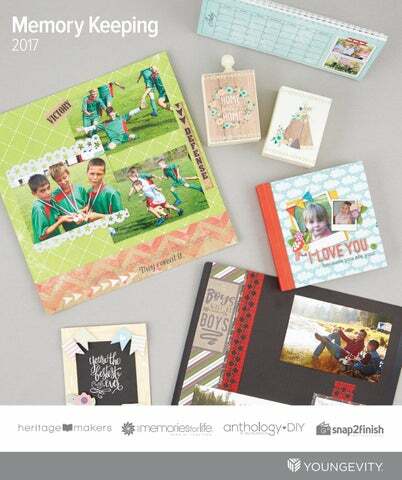 You’re going to thoroughly love all the designs, products, tools and kits available from Anthology DIY by Lisa Bearnson. Canvas Exchange Kits Canvas Exchange is the innovative, fun way to decorate your home using stylish, reusable canvas art. Canvas Exchange material is â&#x20AC;&#x153;peel and replaceâ&#x20AC;? so you never have to replace the base or foundation piece. You can add (and remove) this swappable decorative canvas to any smooth surface to create a new look any time. November Layout Kit Create eight double-page layouts with themes including Family, Halloween, Thanksgiving, and Christmas. Kit includes chipboard, foam tape, and more. Christmas Wishes Paper Collection This collection features magical papers and elements in shades of red, green, lime, teal, and pink. Youâ&#x20AC;&#x2122;ll love the patterned paper, chipboard alphabet and embellishments, frosted red gems, and more that all coordinate for a festive USAN573910 holiday layout or dĂŠcor piece. Holiday Nifty Gifties Kit Create 25 festive holiday gift card holders in five different styles using the color photos and instructions found in the idea book. Kit includes everything you need to create and decorate your gift card holders. In just an hour or so, youâ&#x20AC;&#x2122;ll have USAN573911 gifts you are excited to share with friends and family. Hangin' Around Card Kit Create 20 adorable cards in five styles: four baby clothesline cards, four birthday cards, four hot air balloon cards, four dress clothesline cards, and four fall weather cards. All the supplies and idea cards for each style make USAN571909 it easy to put together. Add style and flair to your paper-craft and scrapbook projects with this colorful embellishment kit. The variety of colors in the Pearls & Brads Goodie Box make creating fun. Textured Cardstock Each package contains 30 sheets of high quality, heavy weight, solid core cardstock. Multi-color packages have two each of 15 colors. Packages come in Vanilla (USAN510080 ) and Tropical (USAN510044 ). Adhesive Runner and Two Refills USAN280010 This refillable adhesive runner is acid free and photo safe. Each cartridge contains 8.73 yards of adhesive that is 0.315 inches wide. This package contains 20 page protectors in two styles (10 each of two mixed pocket styles). Compatible with most three-ring style albums. This set of three acrylic blocks includes grids to line up stamps for beautifully stamped designs. Round corners on paper, cardstock, chipboard, and more with this 2-in-1 punch. Pillow Box Punch Board USAN260401 Create custom pillow boxes using your favorite cardstock or paper. Create perfectly measured borders, frames, and layers in a variety of widths. Memory Keeping CEO Mega Pakâ&#x201E;˘ The Memory Keeping CEO Mega Pak includes CEO Training Materials plus a collection of products from Heritage Makers, Our Memories for Life, and Anthology DIY by Lisa Bearnson. Youâ&#x20AC;&#x2122;ll find home decor pieces, supplies to create scrapbook pages, an album to store your pages in, layout and card kits, and much more in your kit! Get your Memory Keeping CEO Mega Pak today and start building your own creative business. Note: Items are subject to change. Corner Chomper Punch $18.50 1/4" & 1/2"
Corner Chomper Punch $18.50 1/8" & 3/8"
Preferred Customer Enjoy unlimited wholesale pricing (30% off retail) and convenient autoship ordering. Note: Preferred Customers are not eligible to earn commissions or bonuses. Includes a Welcome Kit, (2) Healthy Body Start Pak™ and 1 of each: Beyond Tangy Tangerine®-30ct, Rebound fx™ Citrus Punch-30ct, Root Beer Belly™30ct, Pollen Burst™-30ct, KidSprinklz™ Watermelon Mist-30ct and Beyond Osteo-Fx™ Powder-30ct. Includes a monthly AutoShip of a Healthy Body Start Pak™ 2.0 ($123 116 QV 96 BV). Includes a Welcome Kit and 1 of each: Healthy Body Start Pak™ 2.0, Healthy Body Digestion Pak™ 2.0, Ultimate™ Selenium-90 caps, Slender fx™ Sweet Eze™-120 caps, Ultimate™ EFA™-180 softgels, Rebound Fx™ canister, KidSprinklz™ Watermelon Mist-30ct, Ultimate™ GlucoGel™-240 caps and an assortment of GOFoods™ products. Includes a monthly AutoShip of a Healthy Body Start Pak™ 2.0 ($125 120 QV 100 BV). Includes a Welcome Kit and (2) Healthy Body Start Pak™ 2.0. and 1 of each: Slender Fx™ Cleanse Fx™-60 caps, Slender Fx™ Food Fiber™-49gm shaker, Sweet Eze™-120 caps, Body Trim™-30ct, Slender Fx™ Meal Replacement Shake - French Vanilla and As Slim As Possible (ASAP). An AutoShip of Healthy Body Weight Loss Pak™. ($173.50 160 QV 134 BV). Contents of kits subject to change without notice, visit www.youngevity.com to view current contents. Products for Heritage Makers, Our Memories for Life, and Anthology DIY up to June 2017.